, but it's probably your best bet if you're in the center of the city and looking to fill up on healthy food. Shop around and you'll find plenty of the usual tropical fare, with selection depending on the season. When I visited in February of 2012 there were bananas of several types, durian (out of season and on a cart outside the market), plenty of tropical greens like water morning glory, two types of mangoes, papayas, several types of citrus, pineapples, and numerous other selections. Chow Kit is a sprawling, messy, and sometimes unsanitary place mixing fruits, vegetables, and smelly cuts of meat (warning for those of delicate stomachs, you'll find bloody haunches and pig heads staring you down when you're walking the narrow aisles between vendors). You walk around and dodge the puddles while vendors hawk their produce. If you haven't been to Malaysian or Indonesian markets before (similar to Ubud Market, but without the haggling over prices), you're in for an experience. I arrived in Kuala Lumpur to get a visa and tour the city, but since I eat a healthy raw food diet centered around fruits and vegetables, the Malaysian traditional spicy fare, as well as the Chinese, Indian, and other import cuisines available in the city weren't going to do it for me. That left me looking around in the part of the city where I'd found a hotel, Chinatown, only to to be disappointed. Kuala Lumpur is an interesting city with a lot of culture, far better infrastructure than you find in most of Southeast Asia, and an economy that dominates the region. However, it's obvious that these achievements have pushed the relatively low-profit fruit markets out of the city's center. Central Market, for instance, on the border of China Town, was once a wet market that got replaced by a touristy souvenir market in the 1980s (note that the term, "wet market" indicated a produce market in Malaysia, as opposed to the other types selling various goods). 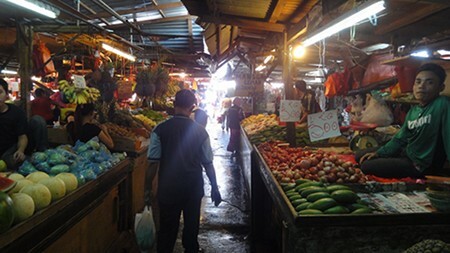 Of the several wet markets I visited, Chow Kit was the best, as well as the closest to the city center. There may be better ones, but I didn't find them during my brief stay. If you don't feel like hitting a market, there are plenty of small fruit carts and stalls, particularly in Chinatown. However, it's obvious these are meant to sell small quantities of overpriced tropical fruit to mangosteen-befuddled Westerners. In short, if you eat a healthy quantity of produce, you'll be getting ripped off. The prices inside the wet market are vastly superior. 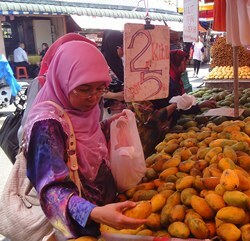 In Chinatown, a kilo of nam dok mai mangoes was going for 9 ringgit when I was there. At the market, it was 3 kilos for 10 ringgits. It also seems that the carts and stalls mostly import out-of-season produce like mangosteens and rambutans, none of which were available inside Chow Kit, which only seems to stock seasonal produce. Kuala Lumpur is not particularly bike friendly, which is my normal mode of transportation in cities. Although walking is easy, the city is sprawling and it may be a long haul to Chow Kit, depending on where you're staying. Taxis are abundant, but I went with the light rail system. The line with a stop closest to Chow Kit is the KL Monorail. You can get on at KL Sentral Station (the main transit hub for the city) as well as connecting stops from the other lines. The stop off the KL Monorail line you want is simply called "Chow Kit" on the transit maps hung up in the stations. If you look out the window when you're approaching the stop from the south you can see the market from above, and the entrance is on the same street the stop's exit is on. You can also use the google map below to find directions from your location. Find other good fruit spots like chow kit around the world.